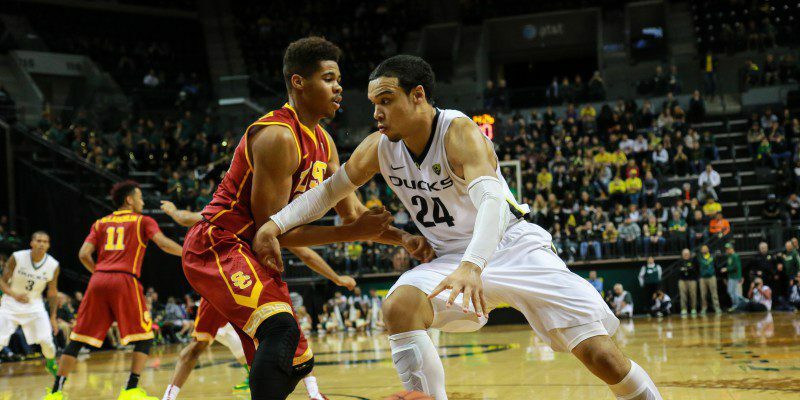 The Oregon Ducks men’s basketball team will match up against Andy Enfield and the USC Trojans tonight at the Galen Center in Los Angeles, California. The Ducks (17-7, 7-4 Pac-12) have enjoyed a successful, yet surprising season, and they’re currently in third place in the Pac-12 standings. It’s no secret that Oregon wasn’t expected to do much before the year started, but the men in green and yellow come into tonight’s game on a three game winning streak, and they’ve won five out of their last six ball games, as well. On the other hand, the Trojans (9-14, 1-10 Pac-12) have struggled mightily all season long, and they currently find themselves in a tough predicament. USC has lost eight games in a row, and since the calendar flipped to 2015, Enfield’s squad has only come out victorious once, losing in 10 out of its last 11 games. The Ducks and the Trojans have each taken a completely different path to get to this point, and with only a handful of games left in the regular season, both teams are looking to accomplish different goals. The Ducks’ goal is to finish the season as one of the top four teams in the Pac-12 standings (top four teams get a first-round bye in the Pac-12 Tournament), and they also want to continue to impress the college basketball committee because it will ultimately decide their NCAA Tournament fate. USC, however, has nothing to lose at this point. The Trojans are the fourth-youngest team in the nation (first in the Pac-12), and the primary goal for USC is continue the development of its inexperienced players. Los Angeles will welcome back a familiar face tonight as Jordan Bell, who is from Long Beach, California, is projected to start after serving his one-game suspension. Oregon’s big man did not participate in the team’s victory over Washington State this past sunday; he was cited for harassment last week. Despite his absence, the Ducks’ leading scorer, Joseph Young, and Dwayne Benjamin, combined for 54 points, 15 rebounds and nine assists. However, Bell’s presence down low will be needed tonight. The Trojans love to get out in transition, and they also rely heavily on wing penetration, but they’re also the most offensively challenged team in the Pac-12. Bell pulled down 13 rebounds and blocked four shots when these two teams first met in Eugene. If the Ducks’ big man can replicate that performance and cause havoc in the paint, Oregon should have a great chance to walk out victorious. The Ducks will look to win their fourth consecutive game tonight.